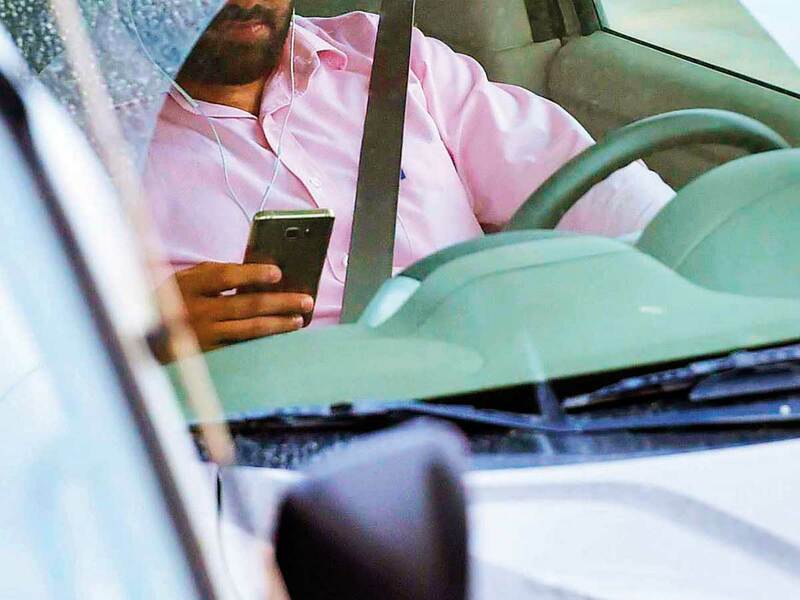 Dubai: Distractions while driving claimed the lives of 59 motorists in the UAE last year, prompting authorities to launch a federal traffic campaign telling drivers to keep their eyes on the road. Major General Mohammad Saif Al Zafein, head of the UAE Federal Traffic Council, on Thursday said the three-month campaign, titled ‘Avoid Distraction While Driving’, will enhance road safety by targeting the negative behaviour of motorists who use their mobile phones, eat, read, fix their headware, apply make-up or even smoke shisha, while driving. “Such behaviour causes serious accidents that result in death, injuries and financial losses,” said Maj Gen Al Zafein in a press conference in Dubai on Thursday. “Last year about 468 people died on the roads in the UAE for different reasons, but 13 per cent died as a result of being distracted while driving,” he added. Official statistics revealed that being distracted while driving resulting in sudden swerving caused 438 accidents where 59 people died and 495 others were injured last year. There were 3.83 road deaths per 100,000 people last year, and Al Zafein said being distracted was a major cause. “The campaign will enhance the efforts of the country’s traffic bodies by focusing on the most important primary causes for distraction from the road,” he added. “Any distraction can lead to disastrous consequences that could be easily avoided by paying attention. Police in the UAE handed out 88,619 fines to drivers for using their phones last year, a further 4,184 were fined for being distracted for various other reasons. The fine for being distracted is Dh800 and four black points. The Ministry of Interior said the campaign is being implemented in collaboration with several strategic government and private sector partners and will include lectures, workshops and the distribution of brochures to raise awareness on the dangers of being distracted while driving. Ali Al Kharusi, the manager of Quality, Health, Safety and Environment (QHSE) at the National Ambulance service, said: “As emergency medical responders to incidents resulting from distracted driving, the National Ambulance often witnesses the human cost of this lack of care and attention. Al Kharusi added that the National Ambulance service’s participation in the campaign involves the launch of an integrated media plan and a series of awareness activities, including campaign material on the exterior of ambulances, videos and call to action messages on social media, articles in the press, broadcast interviews and other media, which will be available in dynamic spots in the northern emirates. Al Kharusi, said that a National Ambulance service crewmember sustained serious injuries in a traffic accident by a driver who was distracted while driving. “She responded to a traffic accident and parked in the emergency line. Suddenly, a distracted driver lost control of his car, swerved towards the emergency lane and crashed into the ambulance, ripping the door off the ambulance and severely injuring the crewmember. The incident left the medic with multiple trauma, while the driver who caused the accident was unharmed. In result, she needed many surgical procedures to recover from the incident,” he added.